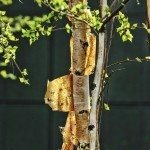 Why is bark peeling from bottom of tree? There are many tree issues that can cause this. Are there any other issues with the tree, maybe with the leaves, trunk or branches? Also, what kind of tree is it, as some varieties peel naturally?